The new generation of Mercedes-Benz Vito is a benchmark among vans. Its new drive system is extremely efficient and delivers top performance. The optionally available BlueEFFICIENCY technology offers the utmost in eco-friendly and economical driving. 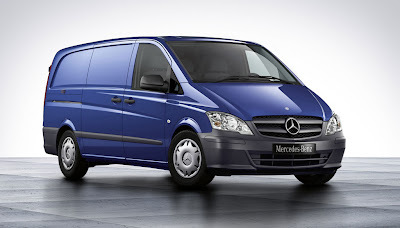 The Vito is also a star in terms of its improved payload and robust nature. Significantly reduced noise levels as well as the new suspension and an upgraded cockpit make handling and controls much simpler whilst also improving the vehicle's ergonomics. Economic running thanks to low fuel consumption, low emissions thanks to emissions level Euro 5 – the new drive system in the Mercedes-Benz Vito demonstrates just what vans fitted with the latest technology are capable of. CO2 emissions and fuel consumption have been reduced by up to 15 percent compared with the previous models, giving record figures.